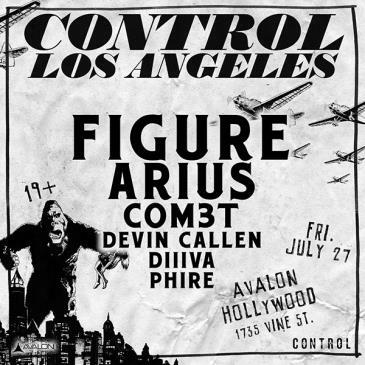 On July 27th, Avalon Hollywood has suited up for a quirky, yet scary bass filled night welcoming Figure, Arius and Com3t for a night filled with the unexpected from these performers on this edition of CONTROL friday’s. Horror themed dubstep DJ Figure will be headlining the night at Avalon with his spooky sounds. Figure is a rising name in the bass community with his live performance skills being recognized as some of the best in the industry. He began his career creating Halloween soundtracks for Universal Studios and since then has ventured off to release 8 music volumes in his own series which is a mixture of drumstep and dubstep. Figure is sure to frighten and entertain the crowd with his dark tones and deep bass, weird sounds you can’t miss. Duo Arius will also be performing their own grimy bass sounds in this bass filled night. Their robotic dubstep sounds keeps them original, along with their live performances, where Tessa Lizz finger drums and raps their own tracks and Dumbo creates mashups on the spot while showcasing his own dance moves. Bringing energy to all of their sets, Arius is an unforgettable act you will want to see. Hailing from LA, COM3T, Dani Thorne’s DJ name will also be performing her own musical talent on July 27th. Dani Thorne began DJing in the duo Master of The People, while she continues to be in the duo, she has transformed to her own unique sounds with COM3T. With her latest release “Habits” she showcases her out of this world, playful electro pop with, deep bass sounds thrown in. She is sure take the energy of the crowd and make it explosive with her catchy and quirky beats. 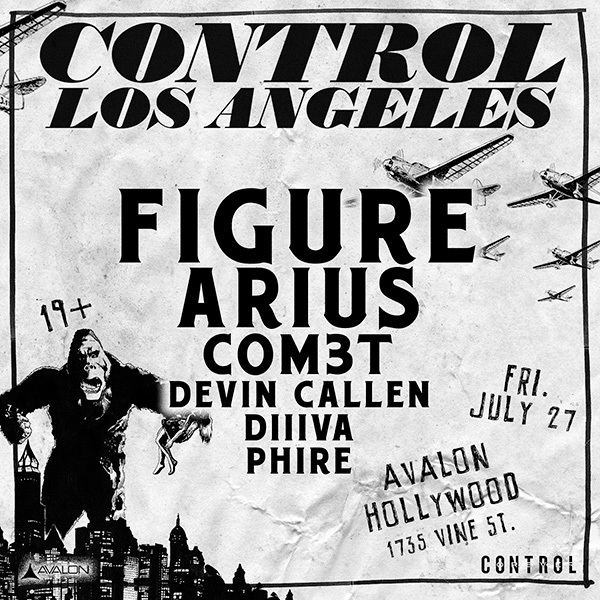 On a night where the music is sure to be filled with both wild and eclectic tunes, be sure to come to CONTROL Avalon Hollywood, on July 27th to witness the talents of Figure, Arius, and COM3T with local talents Devin Callen, Diiva, Phire as well.